My name is Kathleen Bitetti - I am an artist and activist. I was born in Boston and grew up in the City of Quincy. I now reside in South Boston. I have an undergraduate degree/BA from the University of Massachusetts at Boston in art and economics. I was a double major. For my art degree it was in both art studio and art history and for my economics degree my specialization was in public policy. When/How did you get interested in art making? I got interested in art making when I transferred from Brandeis University to UMass Boston. I started off as a photographer. I have worked in the arts since I was 18. First as a visitor service worker for Harvard Art Museums, then as the gallery director for the Harbor Gallery at UMass Boston. I had a short stint at the now defunct Space Gallery and I was the executive director of the Artists Foundation from 1992 - until September 2009. Currently, what type of job(s) you do besides making art? Do you teach, write, curate shows, and/or manage a gallery? I am presently the gallery director of the Lillian Immig Gallery at Emmanuel College (since 1999). I also work at a small family foundation. I also do (unpaid) public policy work for the artists community on local, state and national levels: ArtistsAlliance.us - a new national organization I helped to found. Please tell us a bit about your work in general. How would you describe your work to first time viewers? Since the early 1990s, my artwork has deconstructed the American dream, fairy tales, nursery rhymes and lullabies, gender roles/gender assignment, the fragility of family dynamics, and domestic violence. 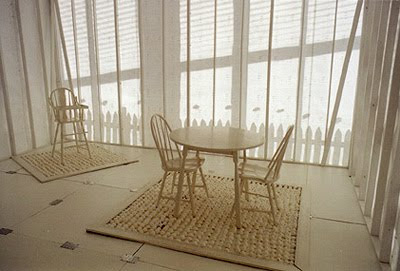 Usually these themes are combined into installations that feature mundane domestic objects, that are pure white and/or colors associated with childhood. These colors establish a dream-like surreal quality, suggest notions of purity and safety, and formally unify the disparate objects in each installation. I view my artworks as characters that can make many appearances over time in different configurations. In 1992 I began to place my work in non-art spaces, and in 2001 I began to embark on community-based artist residencies. One of the main goals of my work is to create a space for dialogue and reflection. Beautyrest: Not All Princesses are Waiting to be Saved, 2007. 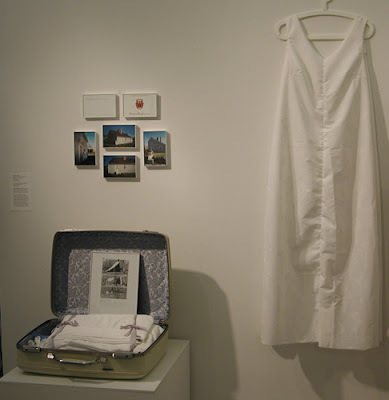 Color photographs, Tiara suitcase, handmade tent and matching dress constructed out of beautyrest mattress material. Dress is specifically made to fit Princess Sophia. The American Revolution began on April 19th, 1775 with the invasion of the British troops and the battles of Concord and Lexington, MA. 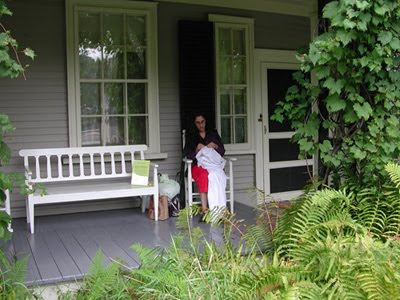 During the American Revolutionary War (1775-1783) Abigail Adams let the Revolutionary Minutemen and the Revolutionary Army camp on her family’s property that is now known as the Adams’ birthplace. This was a brave act given she and her family could have been jailed and/or killed for such actions. Princess Sophia is wearing her hair in a French Twist due to France’s roll in helping the colonists defeat England in the war. What are the thoughts and inspirations behind the creation of your work? My installations and other works act as theater sets and as props. These environments allow the viewers to enter into a deeper psychological space in which the beautiful environments I have created often have undercurrents of unease. It is an unease that makes it hard to determine whether the environment is safe or harmful. Rather the environment is somewhere between the two. Perhaps one of the most interesting spaces to be in. My environments and many of my other works, parallel fairy tales’ original states: an adult story filled with fantastical places lurking with hidden danger. It was these stories that were handed down countless generations - long before they were changed into saccharine tales for childhood consumption and entertainment with the standardized ending: and they lived happily after all. Could you discuss your creative process? How does it all start, what techniques and materials do you use? Research, unassuming and often undetectable autobiographical references, historical references, contemporary sociopolitical issues, and humor comprise the conceptual foundation I build on for all of my artworks. The color white and/or the saccharine colors associated with childhood are a constant in my work. The act of sewing is very important to me. Many of the pieces for ThePrincessProject.com are hand sewn by me and/or are fabricated on my own sewing machine. Are you currently showing your work? What can the viewers expect to see in this exhibit? What is the specific message you strive to convey to your viewers through this exhibit? Viewers will see recent and new works from my ThePrincessProject.com that utilize 1960’s vintage suitcases. I recently came back from a residency at Gozo Contemporary in Malta so there is a new work in progress from that residency in this show. 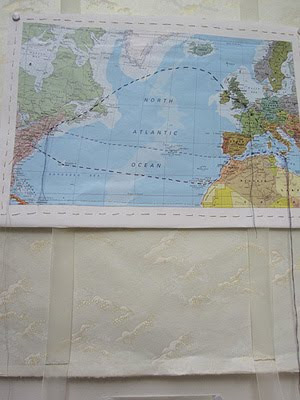 Detail of map: Royal Traveler - Crossings: Malta, Works in Progress, 2009. Detail of Royal Traveler: Sewing for Abigail: Three white dresses sewn at Abigail Adams’ Houses for: Abigail Adams, Princess Sophia Solar Michalski, and Barbie. The entire installation is made up of three individual works that were reconfigured and adapted to this gallery space. The Sewing for Abigail component asks the question why is Barbie seen as role model and better known than Abigail Adams? Dress Up calls to attention the impossible body measurements/body type of Barbie (all the clothes are made to fit Barbie’s Measurements scaled up to supermodel height). And finally Then (Lilli) & Now (Barbie) calls attention to Barbie’s dark past. ThePrincessProject.com has been going on for quite sometime. In 1995 my thoughts about the princess myth and the violence commonly found in fairy tales surfaced full force in my crib sculpture entitled, “Some Day My Prince Will Come”. This piece is a pristine white adult single bed adorned with white picket fences as side panels, a mattress of hundreds of upright sharp silver nails, and a white pillow with the title of the work hand stenciled in graphite on its white pillow case. 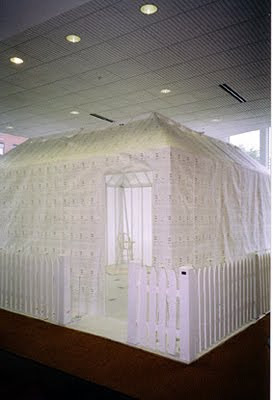 However, I began to explore aspects of these themes in my 1992 installation “Shelter”. And Shelter was the first piece in which I used vintage suitcases. In 1995, I also began collecting source material for a piece entitled, “How to be a Princess Kit”. The end result is on display in this show. It was not , however, until Spring of 2000, with my invitation to attend a residency at the Contemporary Artist Center in North Adams and the arrival of the Tiaras exhibition at the Museum of Fine Arts Boston, that ThePrincessProject.com came into its own. Detail of an installation entitled Tiara Documentation: How to be a Princess Kit at Frame 301 Gallery, Montserrat College of Art in Beverly, MA. 2008. “How to be a Princess Kit- Not all Princesses are Waiting to be Saved” is a window based installation. It has been installed three times in three different versions: ArtSpace’s 2004 Enchantment Exhibition (New Haven, CT), Arts Builds Community’s 2006 Group Show at 125 Summer St.’s public display cases (Boston, MA - the group show was taken down in protest due to the private management company wanting to censor my installation), and “How to Be A Princess Kit (Romantic)“ at Montserrat College of Art’s Frame 301 Window Project in October 2006 (Beverly, MA). 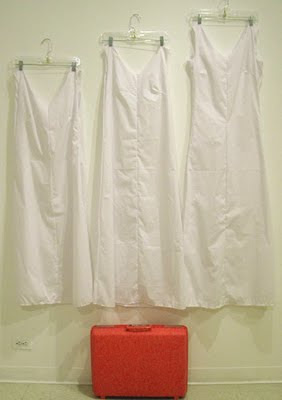 The installation is comprised of several white Tiara vintage suitcases. The suitcases have items for one to use to survive in the woods and also other objects that any self-respecting princess would need when away from home. Many princesses in fairy tales are often left to die in the woods. This kit is created for a princess who takes a proactive approach in her safety measures and overall well being. Often people forget that the fairy tales we pass down from generation to generation were meant to be adult tales and are filled with domestic violence. All three versions included my signature white plaster birds and the posters I designed for a domestic violence poster campaign that was sponsored by the Lawrence Police Department (MA). One of the posters was translated into Spanish. The free posters were distributed around the greater Lawrence area, Boston, and beyond. ThePrincessProject.com utilizes the internet, new media, digital imaging, sculpture, performance, photography, installation, sound- in short what ever it takes! The project is designed to allow me to invite guest artists to work on certain aspects of the project with me. One of the main elements of ThePrincessProject.com is to interact directly with teenagers and college students, as well as with the general public. Thus siting my work at a college gallery is really important to me. Her Royal Highness Princess Sophia Solar Michalski has been graciously acting as the Project's muse since 2000. She has turned out to be a very good sport! Making art and making public policy. Don't give up, don't isolate yourself, and create your own supportive community. Also do not stay only in the art world - broaden your community. Essentially don't be a closet artist in the non-art world. I have found that the people I have met in the policy sector and government sector to be very interested in my art work and my art projects. Many have helped out with them. Some have also become very good friends of mine. Would you provide links to articles and reviews about your work? Yes, I am up for commissions - but I am not represented by any gallery as my work is project and community based. I just recently finished an artist book commission of my HealthcareForArtists - a fairy tale scrapbook of Health Care Reform in Massachusetts (the artist book prototype is in the show at Emmanuel).